We went from Cars to Supercars, to Hypercars to Ultra cars and now Damn Well Totally Manic cars with the news of the resurrection of the Brabham name in the Brabham BT 62. The Brabham BT62 is a mid-engined track day car produced by Anglo-Australian car manufacturer Brabham Automotive. It was introduced this year with deliveries expected to start at the end of 2018. A planned production of only 70 cars is intended (in honor of the company’s 70 year heritage in racing in PR-Speak). When Jack Brabham was the world champion, the cars had the prefix BT which stood for Brabham and his partner Ron Tauranac, so they are doing the same with this ridiculous car, even though Sir Jack is long gone to the racetrack in the sky, and Ron is 93. The BT62 is powered by a mid-mounted 5.4-liter naturally-aspirated V8 engine that is based on a Ford V8 I believe. The engine has been extensively modified and produces 515 kW (691 hp; 700 PS) at 7,400 rpm and 492 lb ft (667 Nm) of torque at 6,200 rpm, giving it a power-to-weight ratio of 653 hp per ton. Power goes to the rear wheels through a six-speed Australian designed Holinger sequential-shift racing transmission controlled by steering wheel mounted paddle shifters, and stopping is handled by carbon-to-carbon brakes, with carbon pads actuated by six pistons acting on carbon rotors. The chassis of the BT62 uses what Brabham calls a ‘tubular metallic architecture’ and the body features lightweight carbon fibre body panels, as well as carbon-kevlar wheel housings, to give the car a dry weight of 2,142 lbs (972 kg). The car has a full fixed aero package as an option that includes a front splitter, rear diffuser and large rear wing, that are all made from carbon fiber and together are capable of producing 2,645 lbs (1,200 kg) of downforce. The suspension uses a double wishbone setup in the front and rear and features pushrod actuated four-way adjustable Öhlins dampers and adjustable anti-roll bars. The wheels are 18 inch center locking units and use Michelin racing slicks. The interior is relatively sparse as the BT62 is built for track day driving and features FIA-spec carbon fiber seat shells, a six-point harness, Alcantara trim, leather door pulls, an adjustable pedal box, a carbon fiber dashboard, a 12-inch digital gauge cluster, a removable carbon fiber steering wheel and a fire extinguisher. (More PR speak) – Brabham intends to produce 70 cars to celebrate the 70 years since the company founder Sir Jack Brabham launched his racing career in Australia in 1948. The first 35 cars will be finished in the corresponding liveries of Brabham’s 35 Grand Prix winning cars, while the rest will be finished to the owner’s specifications. The BT62 has a retail price of around US$1.4 million (around GB£1 million at current exchange rates). The price includes admission into the Brabham driver development program, which offers personalized driver coaching sessions to help the owners make the most of their cars on the track. 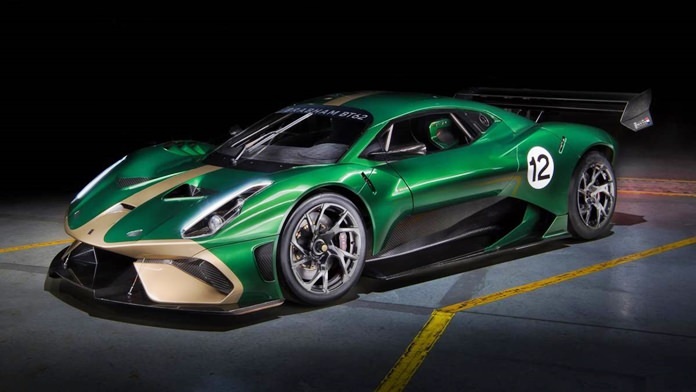 Road Legal Conversions – Although the BT62 in standard form is not road legal, Brabham says that they will offer a service to convert the car to be road legal. They say the work will be carried out in the U.K., and that’s also where the car will be registered after going through an IVA (Independent Vehicle Assessment). International buyers will supposedly still be able to carry out the procedure and be able to drive the car in other countries by having the car shipped back to the U.K. once every 12 months to Brabham for an annual service in order to comply with registration laws. Brabham says they will pay for shipping costs back and forth for the first two years you own your BT62. So there you are, a useless piece of pseudo history which will extract USD 1.4 million from your bank account. But don’t worry if you haven’t got it all in loose change – you can buy it on the drip at a mere 16,000 GBP per month. With that easy finance, I think I’ll have two of them.